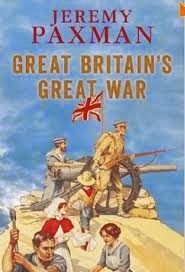 Olney doc muses: Great Britain's Great War. No doubt there are many books yet to be published in the next few years as we enter the anniversary of the beginning of the Great war, 1914-1918. I've already read many on the subject, but Jeremy Paxman's, Great Britain's Great War is one of the most interesting and well written to date. It provides a broad overview of the conflict without getting bogged down in any facet, whether it be the complex of causes of the war, the strategy of specific battles, or the behaviour of the tommy in the trench or the general behind the lines in his chateau. What he does give us is great social detail on the conditions back in Blighty. So we hear of strikes by factory works and even the police, the increasing move throughout the war, towards conscription and the experience of conscientious objectors. The changing role of women and the devastation of venereal disease (over 400, 000 British troops affected). There are excellent summaries of the disastrous Dardanelles campaign, the contribution towards our war effort and premature death at sea of Lord Kitchener, and the Easter uprising in Ireland. The journalist in Paxman is to the fore in his observation of the baby boom of 1920 (957,000 births-never since then exceeded), and frequent reference to debates in the Common and the Lords (one fascinating debate over the necessity of moving the clocks forward one hour to increase daylight working hours, lead to an anguished speech by one patrician Lord who was concerned about twins that might be born at just the moment the clocks changed, resulting in the younger twin theoretically being born before the elder, thus wrecking inheritances in wealthy families!). Yep a good sweep of the conflict 'over there' mixed with lots of social detail. Not a bad place to start if you haven't yet read much on this conflict which still resonates so strongly after all these years.